I was in college when my grandma got sick. One day while my family visited her and my step-grandpa in Oregon, Allan and I drove together on an errand and we bonded over the shared hope we felt as Christians. I was newly enrolled at a Christian college and a half a decade out from leaving behind religion. As we espoused immortal hopes and made ourselves feel better, Allan got to reminiscing about how he met Grandma. One of their earliest dates was visiting my parents, weeks into my life. Allan told me he would always remember that, how my life started at the same as his life with my grandma. Beginnings gift you with so much hope. My grandma died that spring, hand in mine not weeks before it, apologetic of her illness, her mortality. Life is a series of tiny infinite sorrows, chain linked to the next one, with empty, lovely promises filling in the space between. I’m writing this on Easter, and I couldn’t feel like more of a heathen. Not for skipping church (haven’t gone in years), not for sleeping in late after a drunken night at a punk show. For not caring. For feeling so removed from it, moved across the country from it. Sometimes I say “goddess” instead of “god.” I make a cliche of myself, the ex-Christian who jumps so far to the opposite end of the spectrum to over project her over-ness. But it’s more than that, it’s a need to pull it entirely off, the wet bandage clinging to my skin. 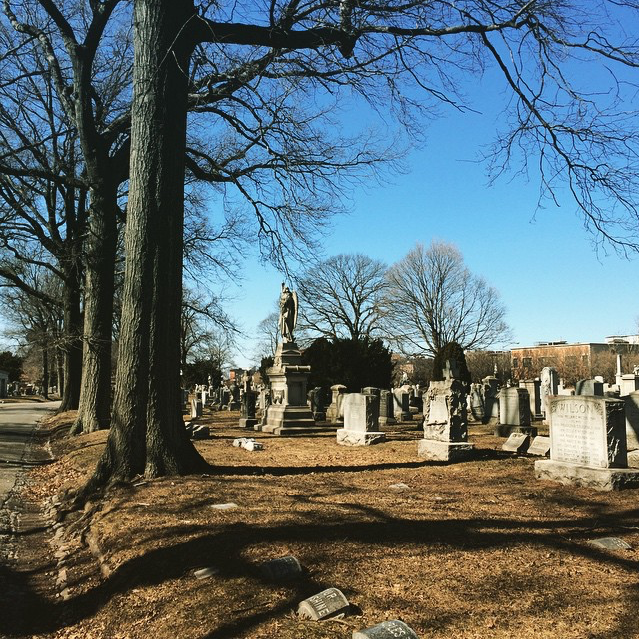 Today, I walked through Green-Wood Cemetery near my house. The gatekeeper knows me so well that when he saw me across the street, he waved to me and let me sneak in before he finished shutting the north side. I moved slowly past the graves, listening to sad-eyed classic rock. I never meant to make a sanctuary out of a cemetery, but it’s the only quiet spot I’ve found since moving here. Plus, I find something calming in walking past the graves, like exposure therapy. I’d rather face my mortality now, embrace it, and move along to actively pursue happiness. Allan died on Friday, 93. My sister told me over the phone while I was at the laundromat. Less than two years ago my dad told me about my brother while I walked down 5th Avenue past the cemetery. I have cried too much in public these last couple years. Sometimes my sadness feels like a new bloom, it’s own perfect individual flower. Others, it doesn’t. Isn’t it funny how small my humanness is? My personal tragedy doesn’t make me unique. It makes me more like everyone else. I am a part of the great human fold of sadness. Last time I talked to Allan, last fall and midway through his illness, I felt scared to call him. What do you say to someone when you think it’s the last time? I asked him if he was scared to die. He said he wasn’t because he knew my grandma was waiting in heaven for him. I didn’t argue, in the same way I avoid talking about politics with him. He was a good man; he was of another time. I thought someday I would write his biography. I thought there would be more time to say goodbye. My mom and I used to joke that he’d outlive all us. He also told me the same story he always did, about meeting me while he was courting my grandmother. She was the best woman, and he loved her. I want that hope, not the delusions we tell ourselves to make eternity less vast and lightless. I want that hope in now, that love of today. Allan lived an extraordinary life. He was the only grandparent I really knew as an adult. He showed me an example of loving someone fully and earnestly. I didn’t feel sadness today. I felt sunshine during my run and a call with an old and dear friend. I felt vegan breakfast burritos and finding inspiration for my next writing project. I felt Allan’s presence and his abundant love from my grandma. You don’t have to believe in something beyond yourself to feel hope. Sometimes you find it waking up on a Sunday morning next to someone who makes you happy. My grandpa taught me that.